FontFamily is a free Windows 8 Font Viewer app that lets you view and compare up to 6 different fonts at one time. If you have to prepare a document or a report and you want to finalise a suitable font for it, then this app is the perfect pick for you. This free Windows 8 Font Viewer app is a single screen app and extremely simple to use. Apart from comparing 6 different fonts on a single screen, the app also supports other important text formatting features such as Bold, Italics, and Increase/ Decrease Font Size. FontFamily is freely available in Productivity category of Windows Store. You can view the app directly in Windows Store by clicking on the link given below at the end. Let’s see how this free Windows 8 Font Viewer app works. 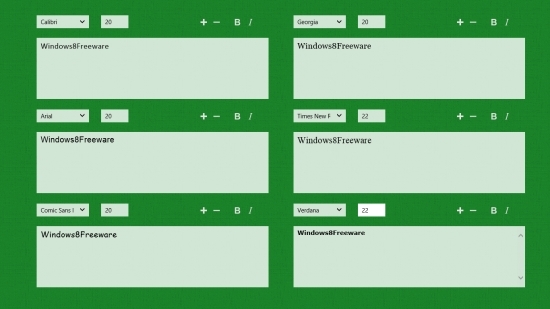 This free Windows 8 Font Viewer app is a simple and convenient tool to compare different fonts on a single screen. As you launch the app, you will land on the main screen of the app displaying six text boxes. Each text box will have options to select a font style, type font size, and other text formatting options. Select the desired font styles for each text box using the drop-downs. You can type a different font size for each text box. Now, type the text in the first text box. It will automatically get typed in the other five text boxes as per the selected formats. You can see, compare, and decide for the one that you want to use in your document. You can also increase or decrease font size, make it bold or italics individually for a text box if you want. Also check ModernNote and TextTouch. FontFamily is a simple and quick app to view and compare up to six different fonts on the screen. Definitely a helpful app to decide the best font for your documents! Try it out and share your feedback via comments.